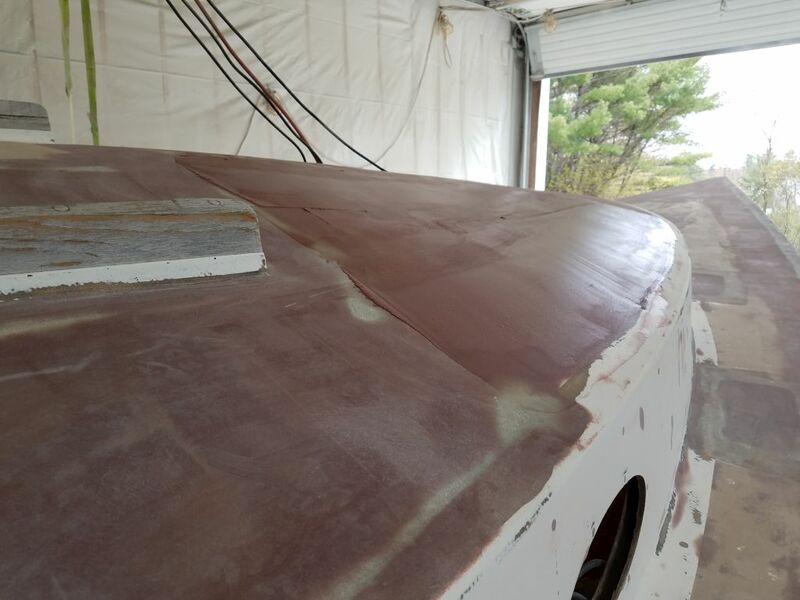 Once more, by hand and machine as needed, I sanded the continuing work on the coachroof, bringing it incrementally closer to its final shape. 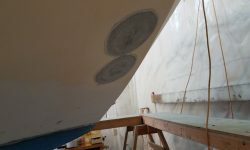 Meanwhile, I sanded the new fiberglass patches in the cockpit area. 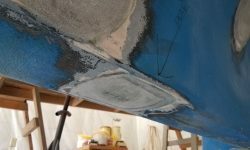 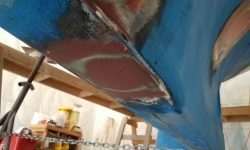 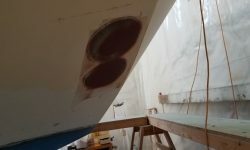 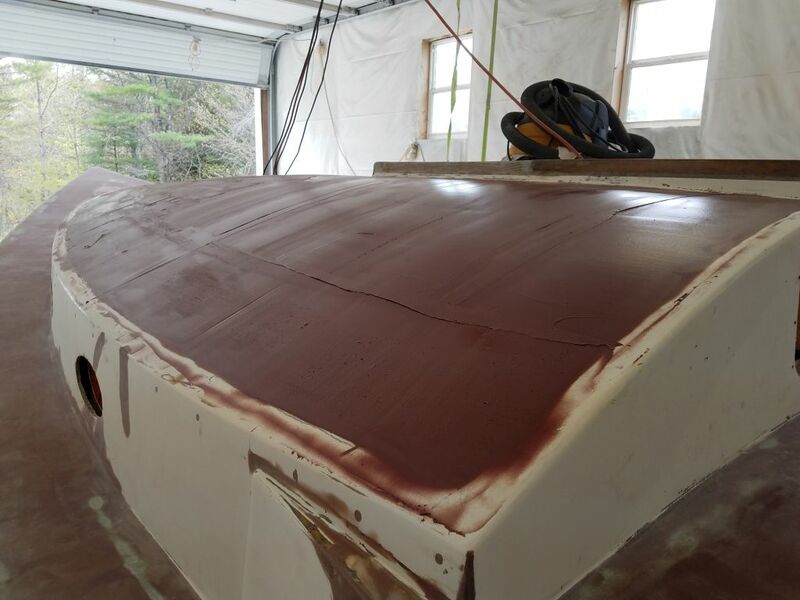 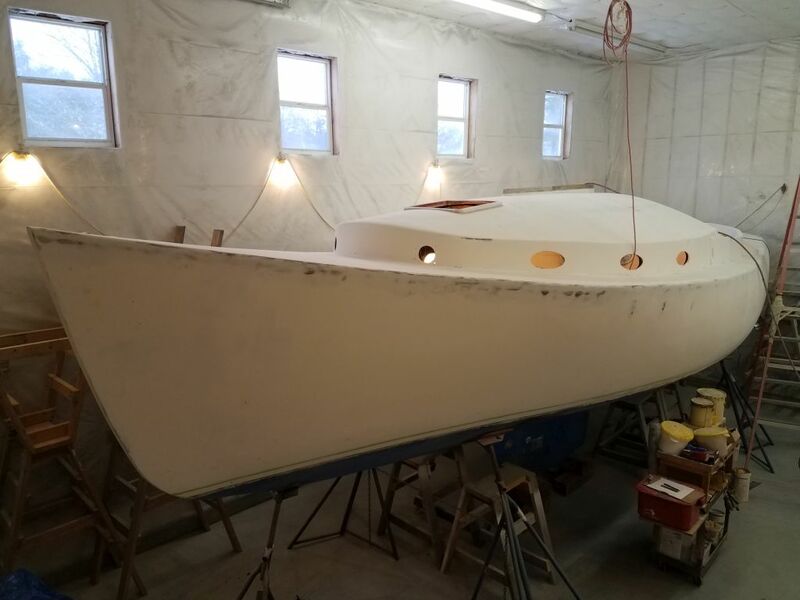 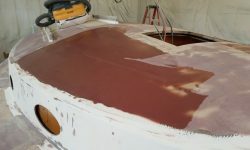 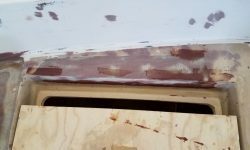 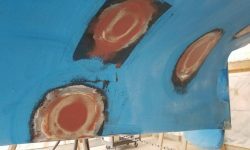 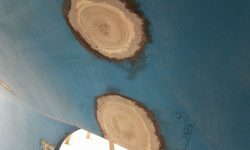 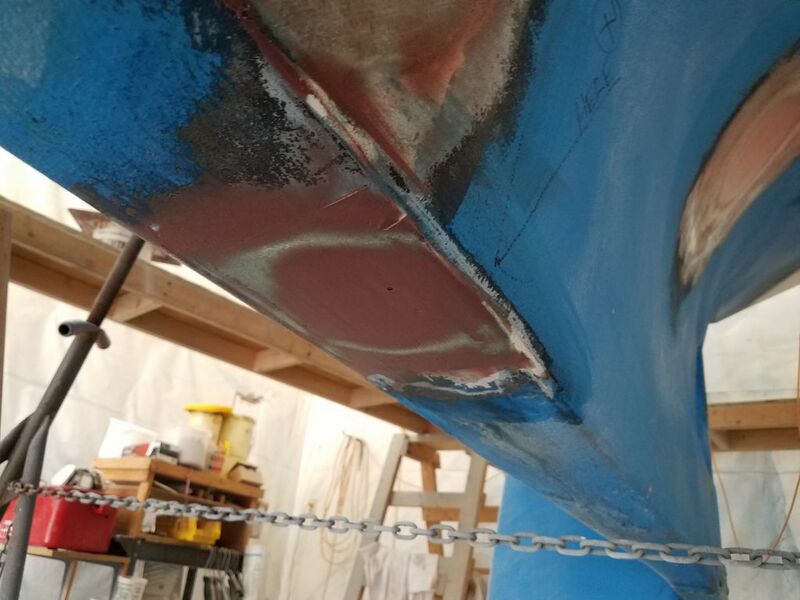 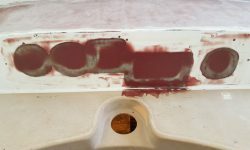 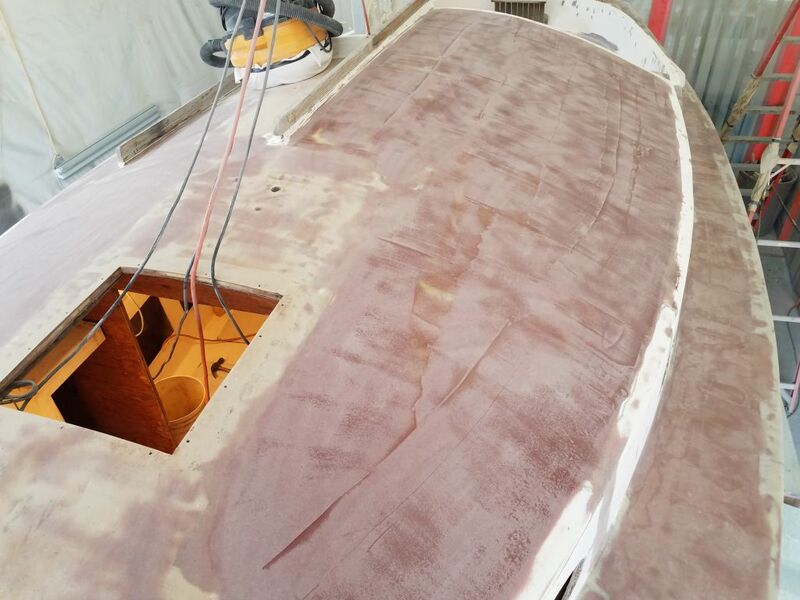 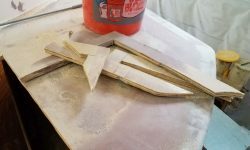 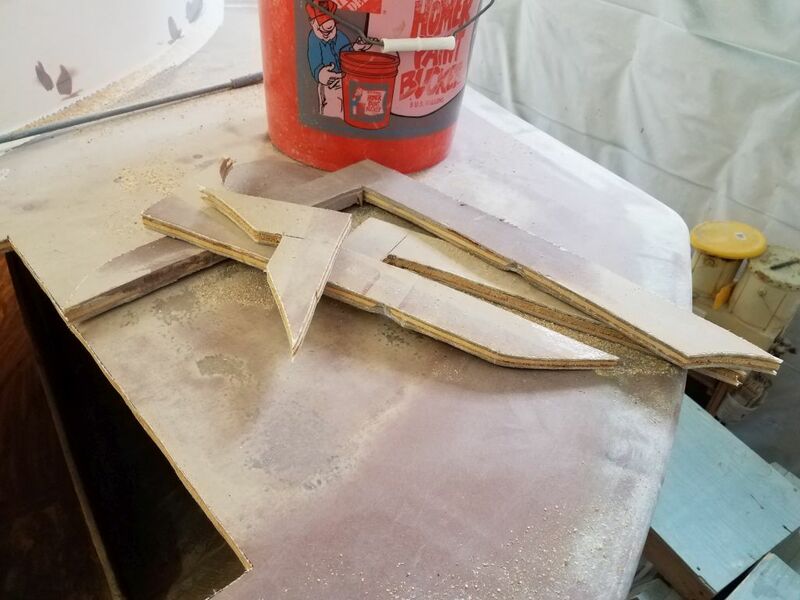 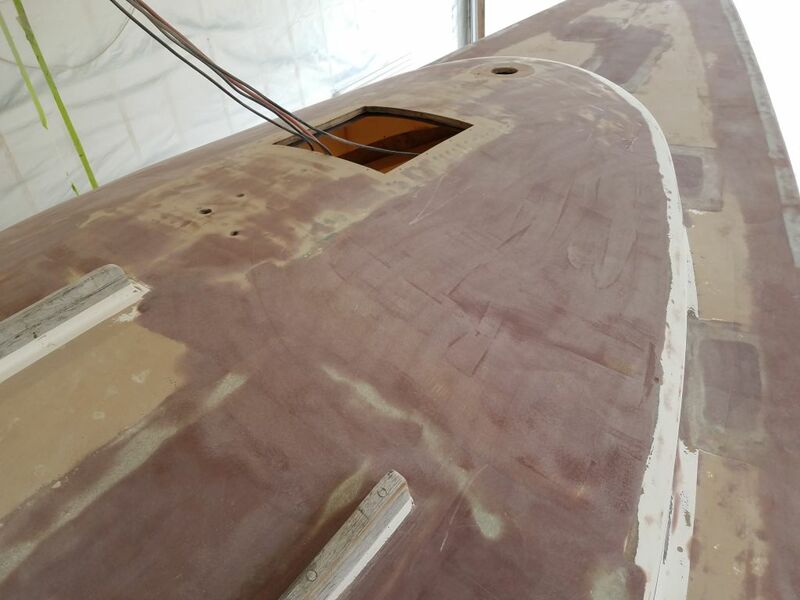 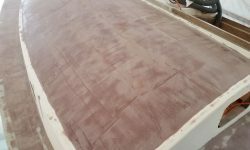 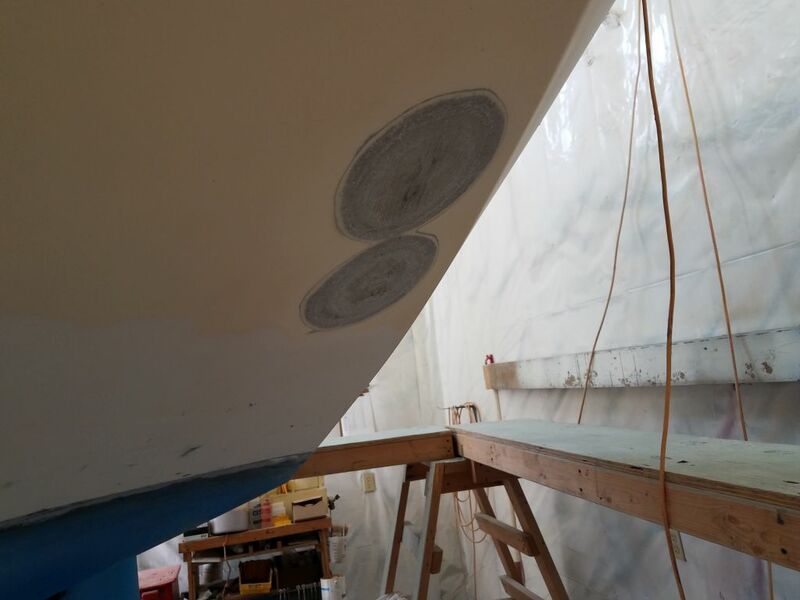 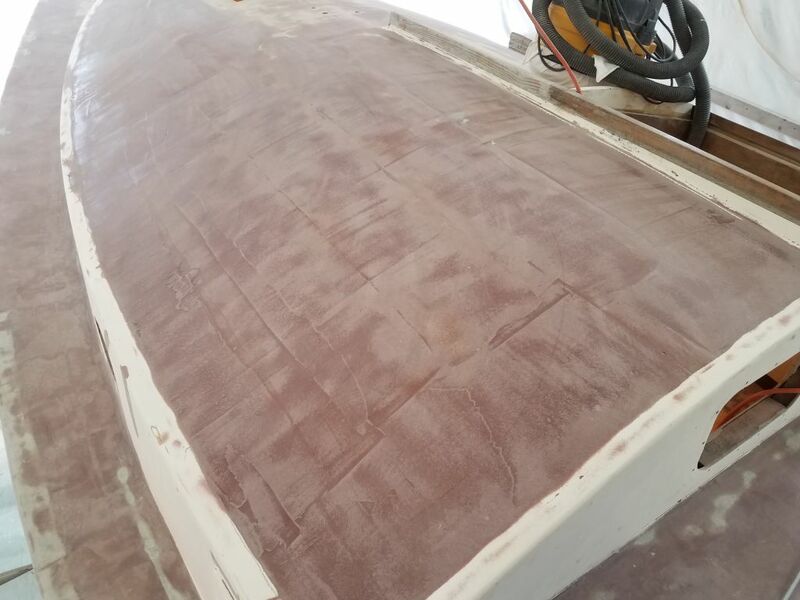 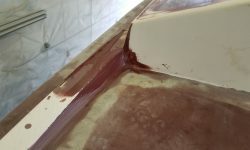 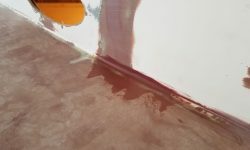 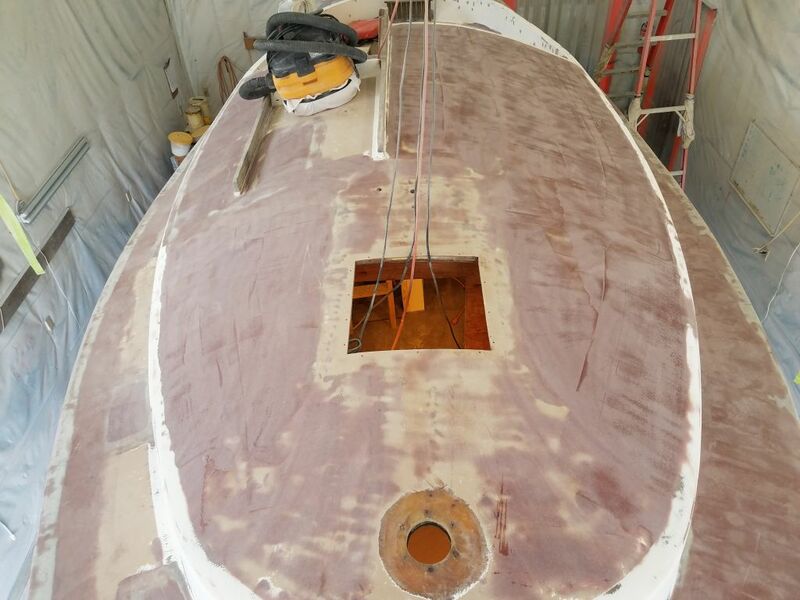 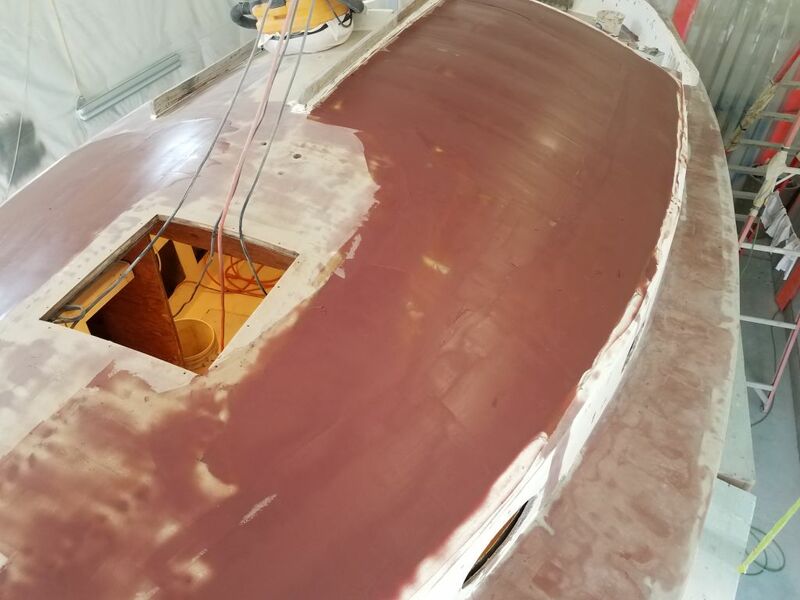 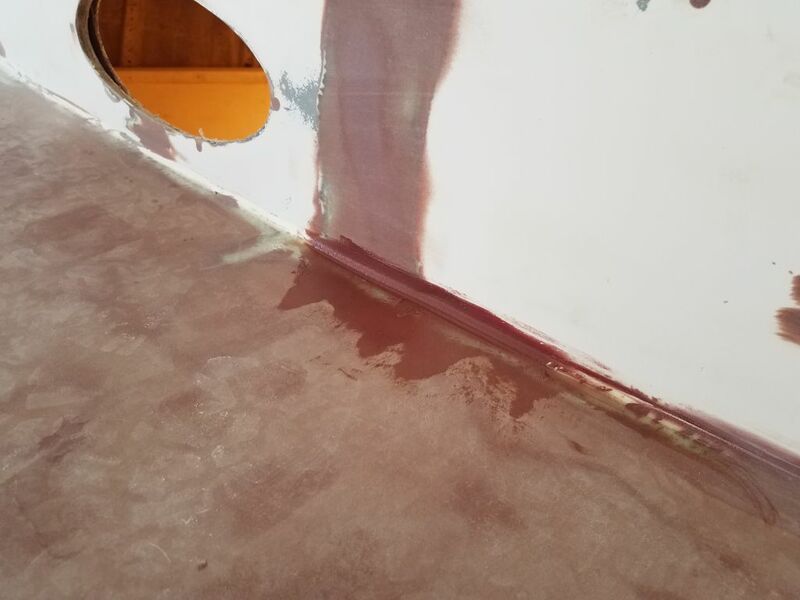 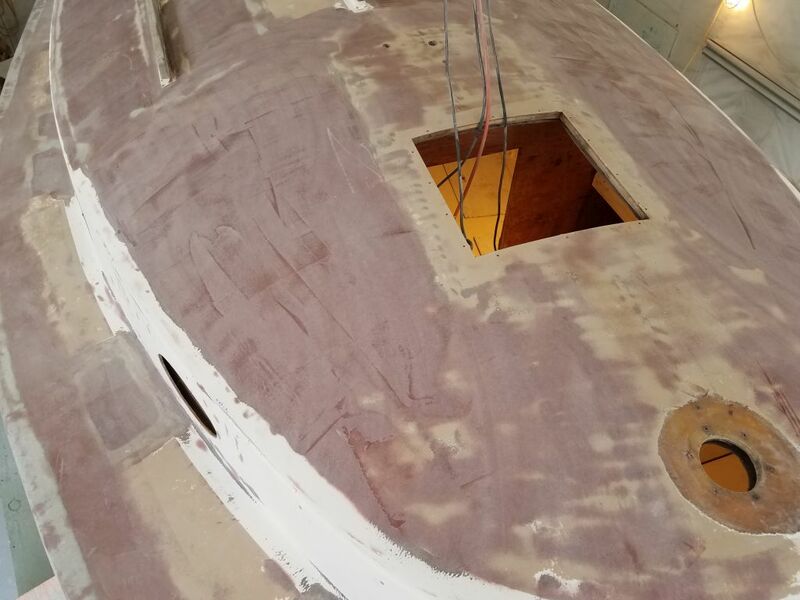 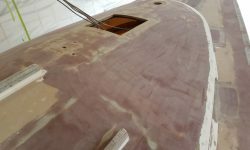 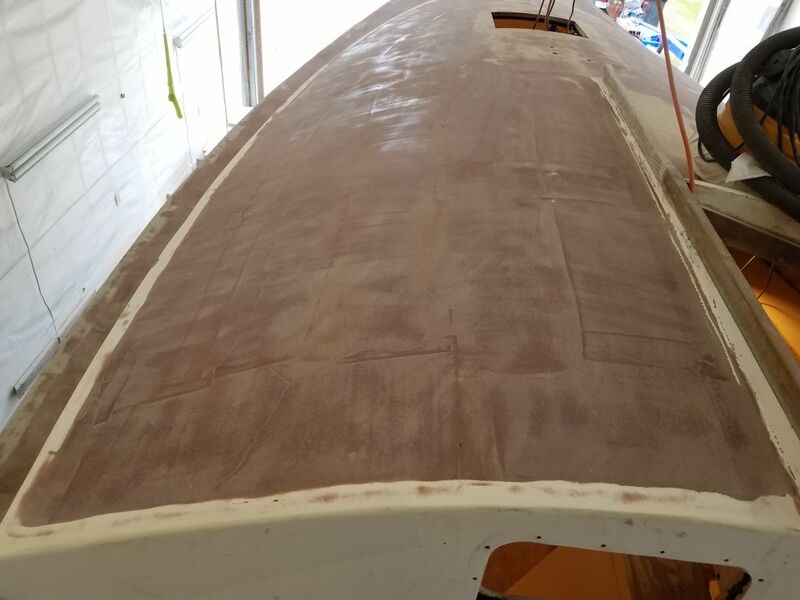 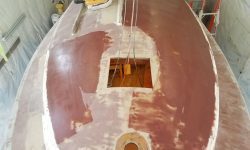 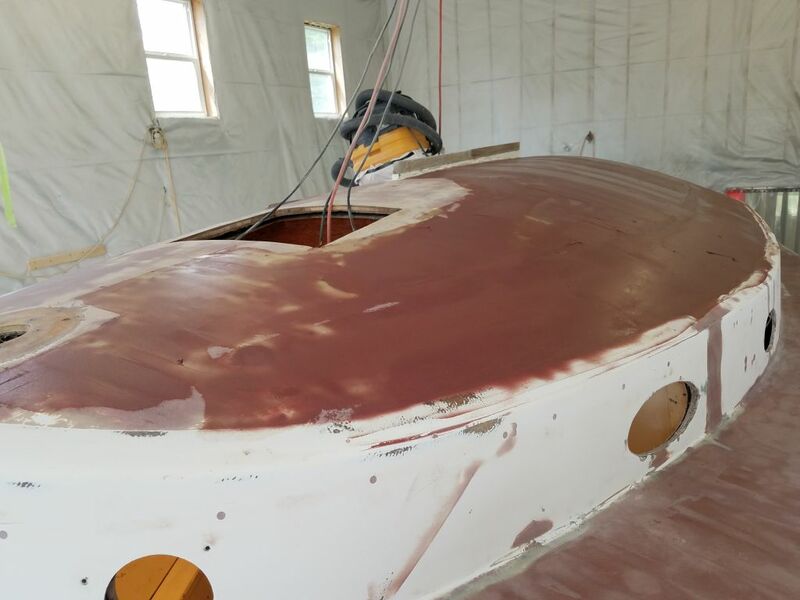 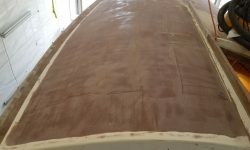 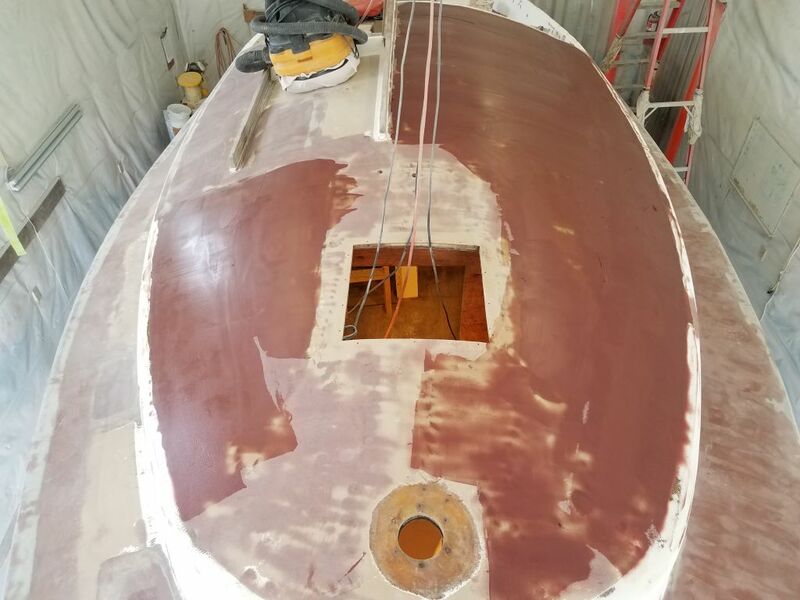 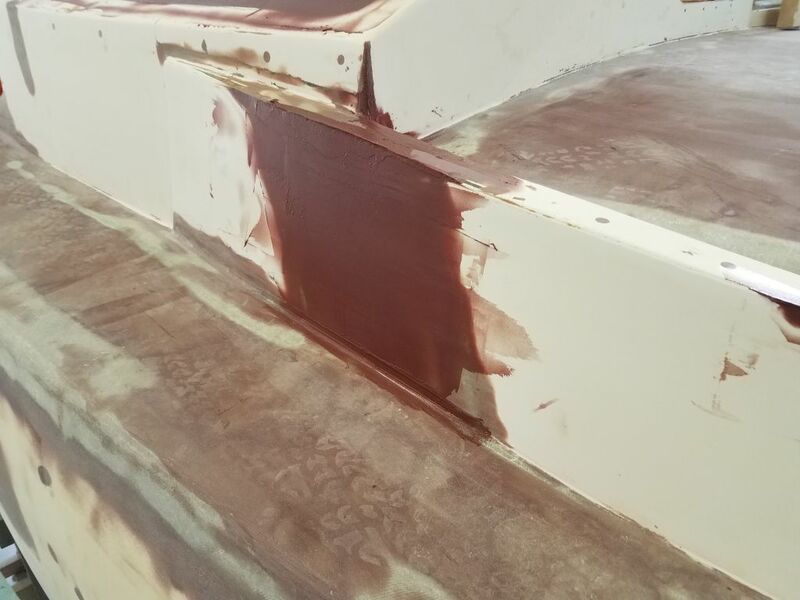 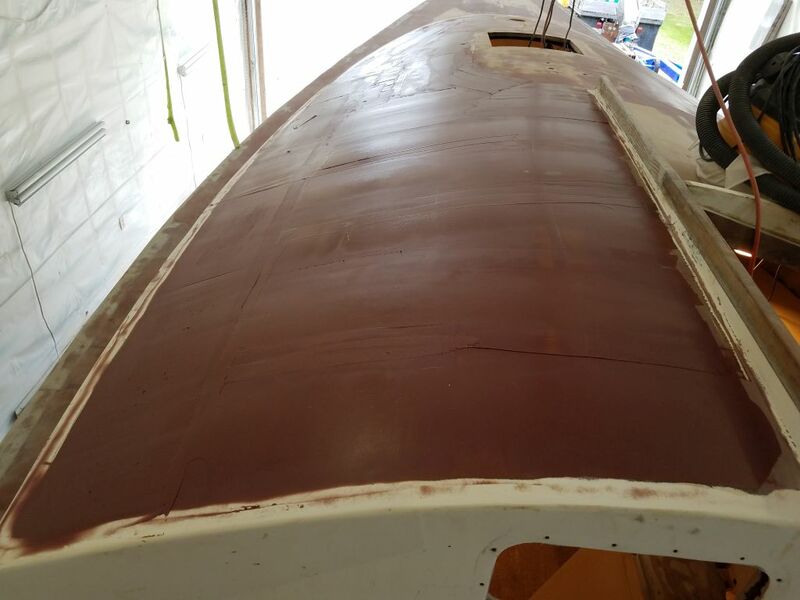 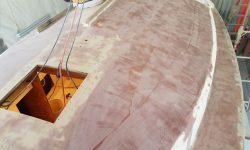 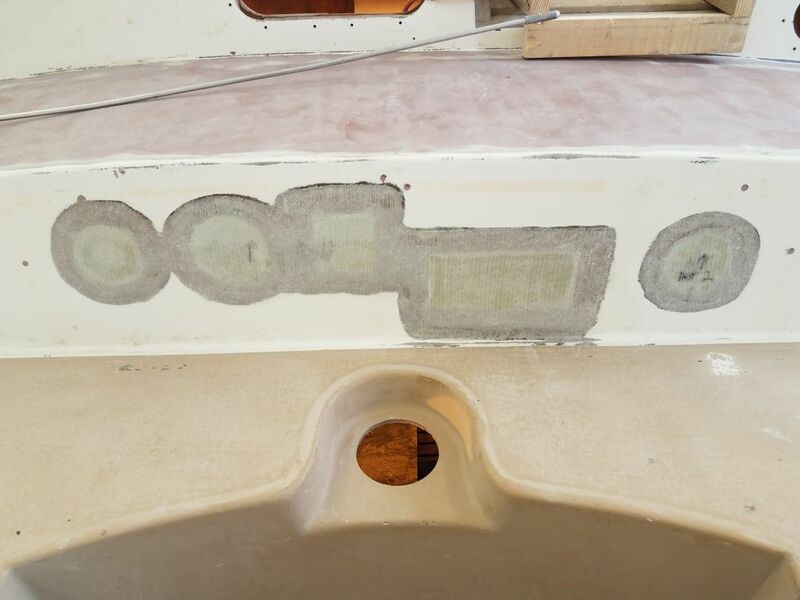 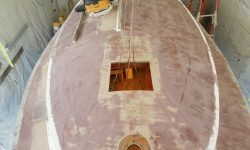 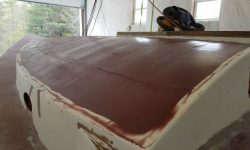 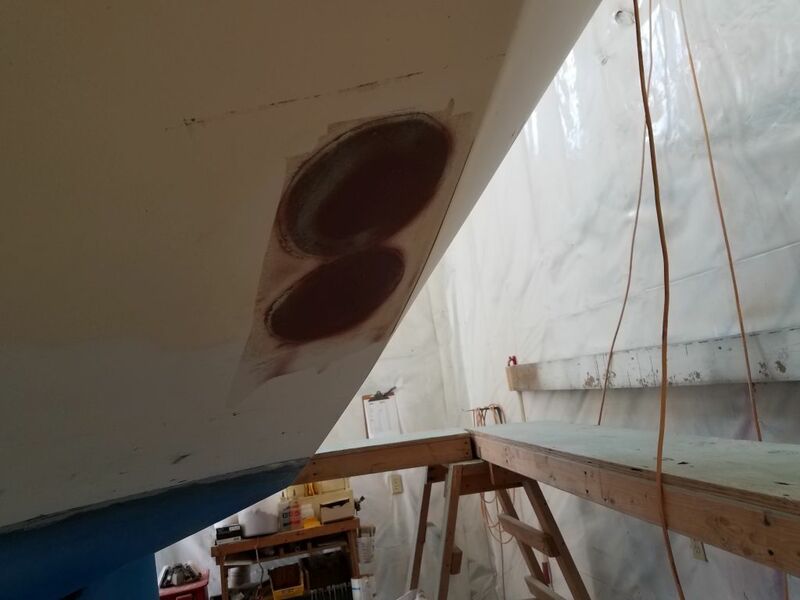 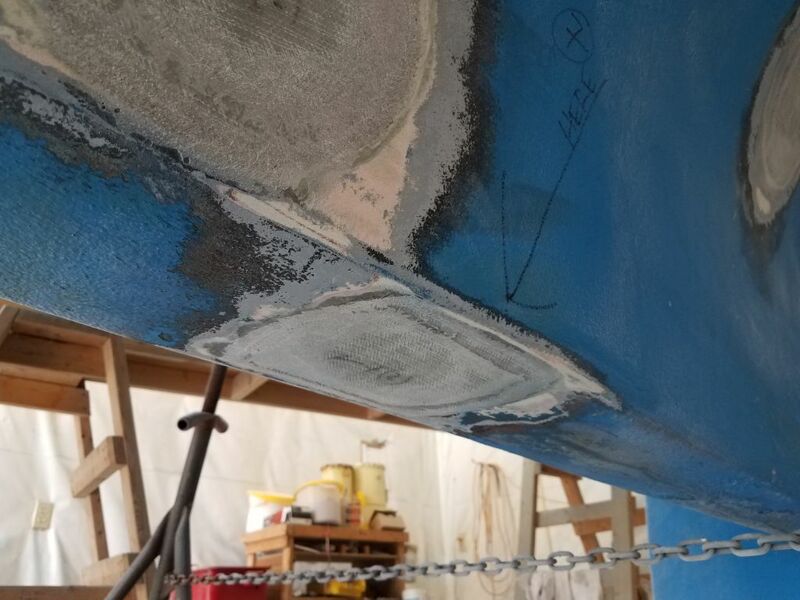 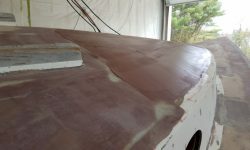 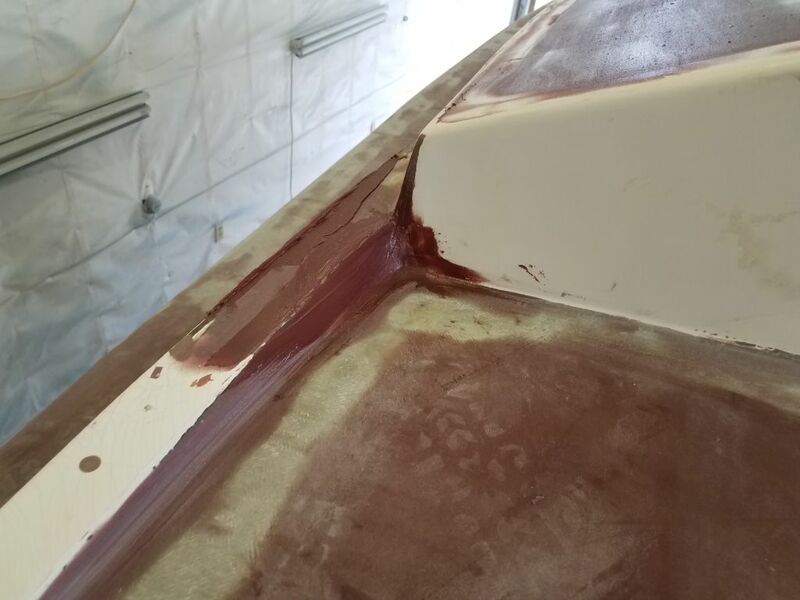 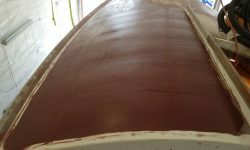 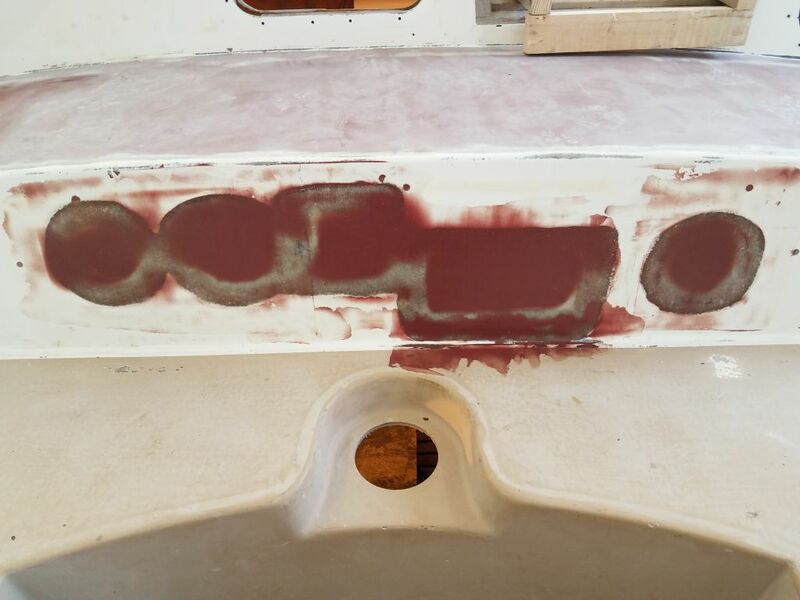 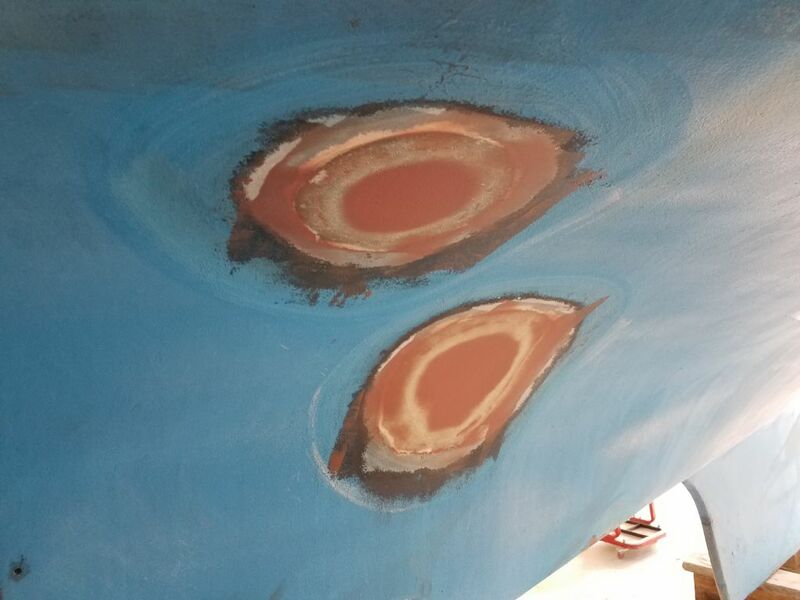 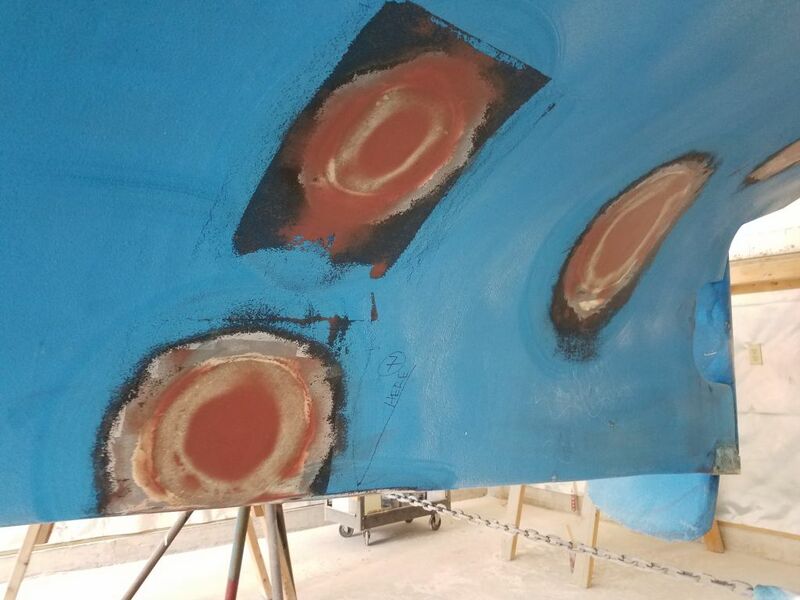 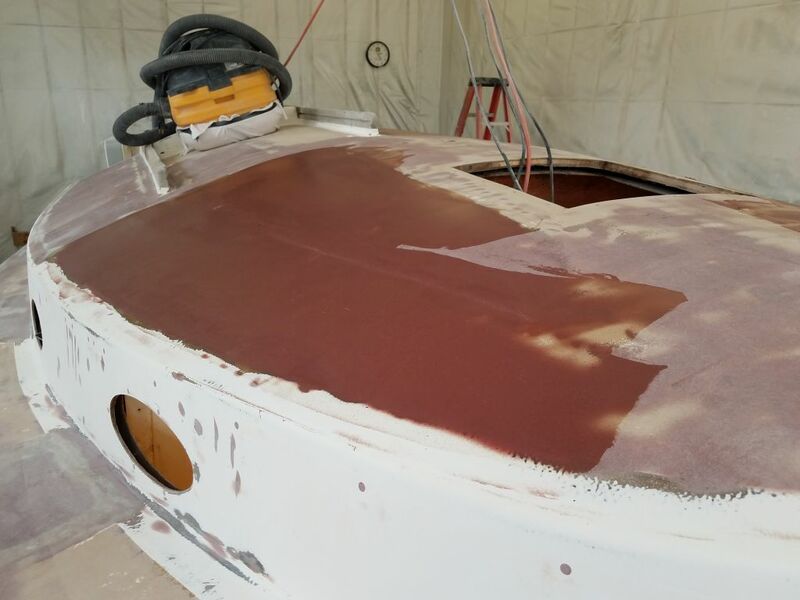 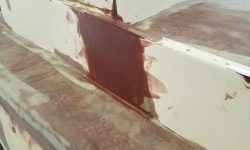 Moving to the shop floor, I sanded all the new through hull patches, bringing the edges flush with the adjacent surfaces and ready for fairing. 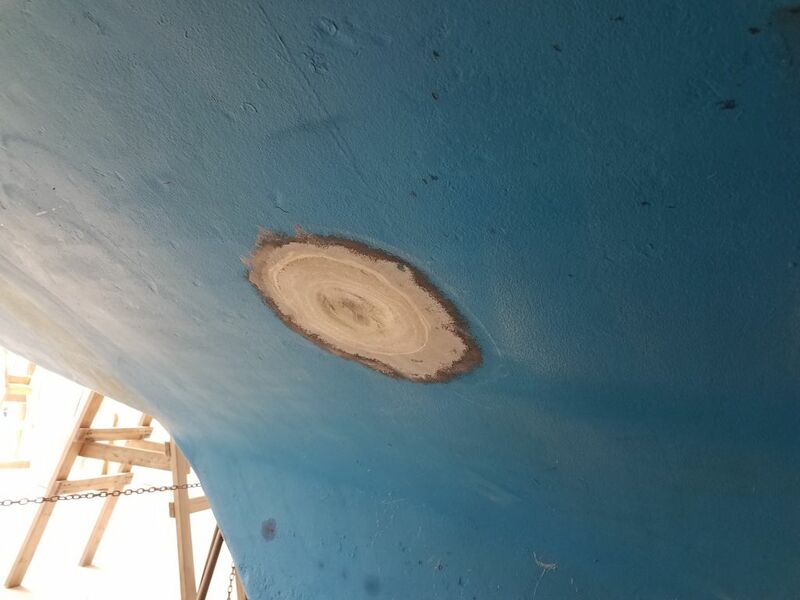 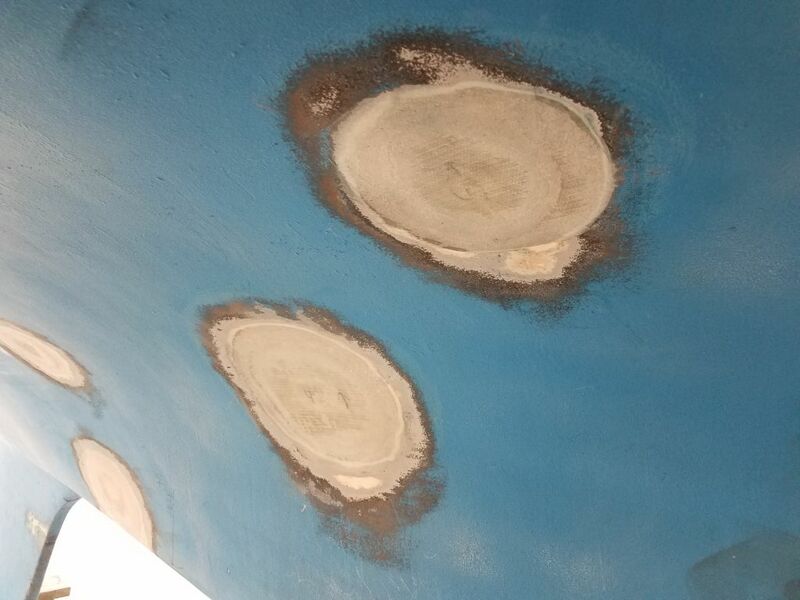 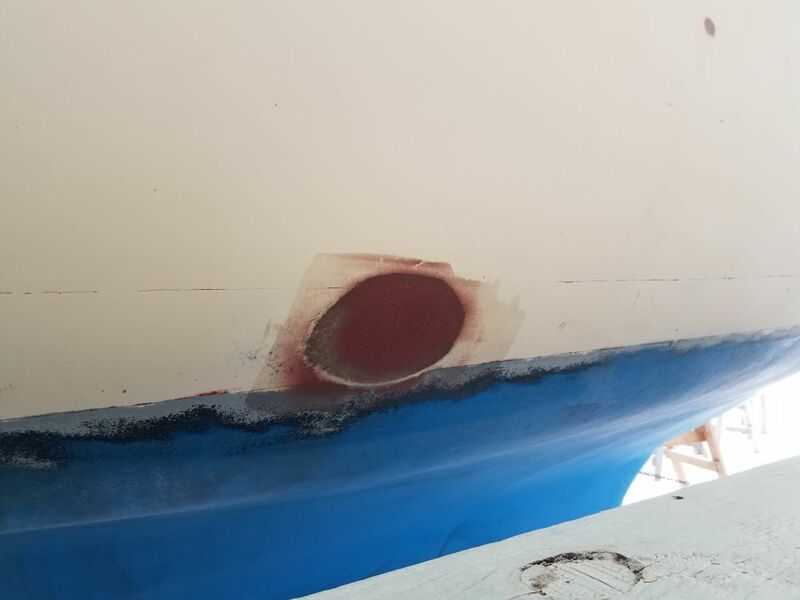 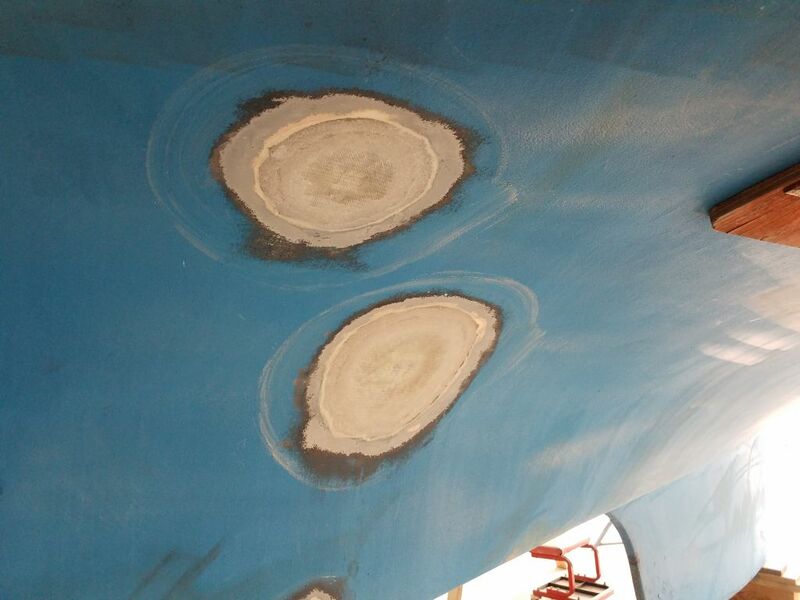 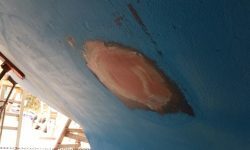 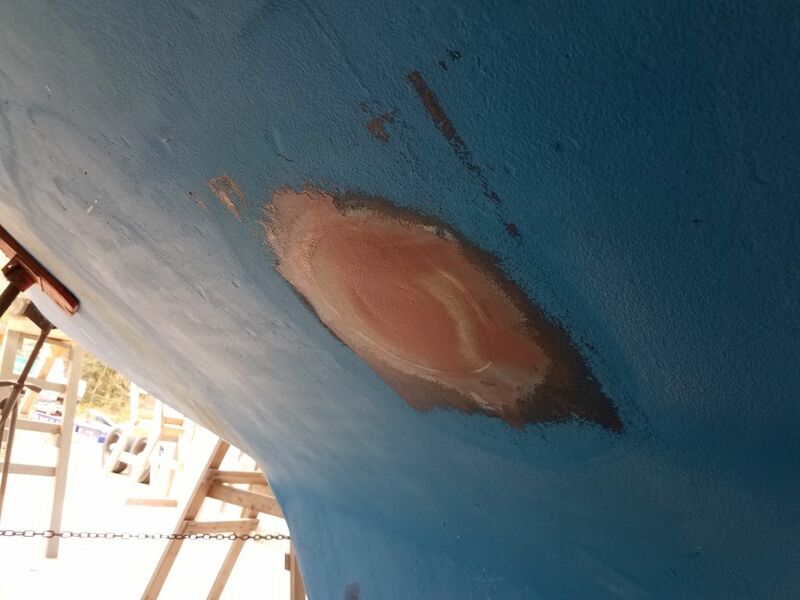 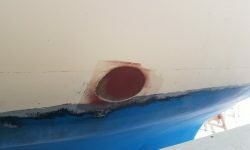 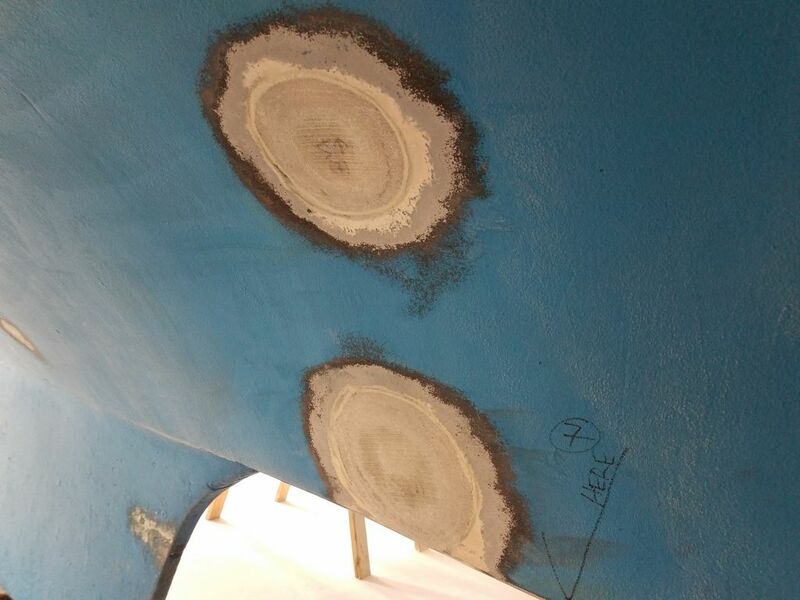 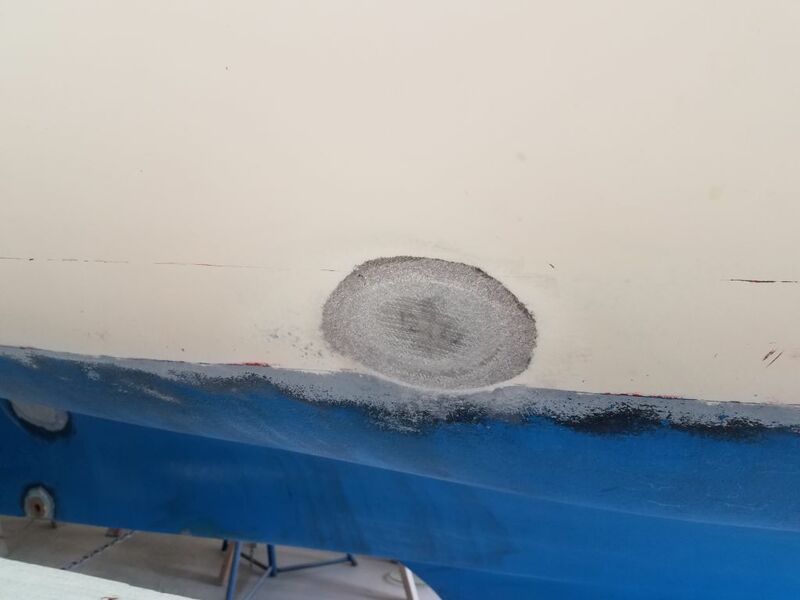 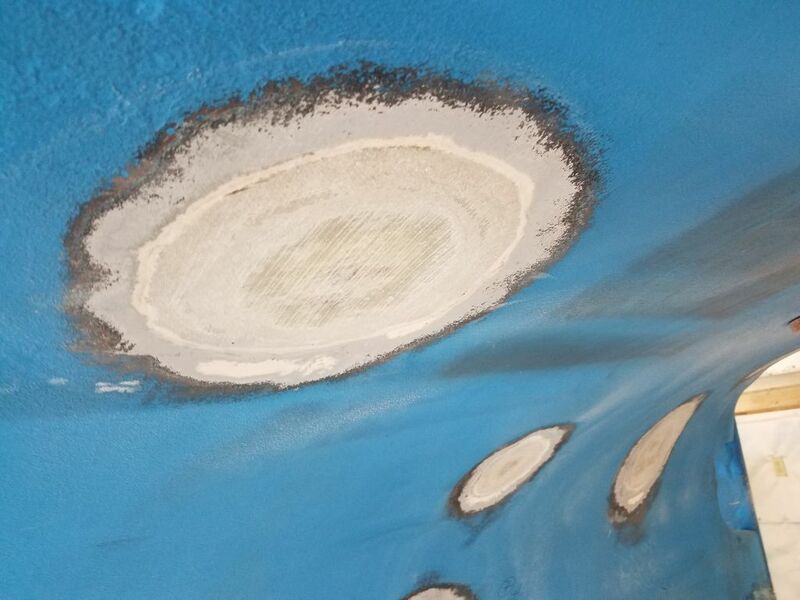 After cleaning up, I applied a coat of fairing compound to the through hull patches. 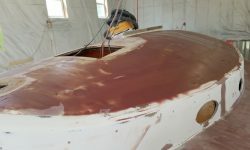 On deck, I continued with another application of fairing compound on the coachroof and on the new patches in the cockpit, plus some detail work in a few other areas here and there. 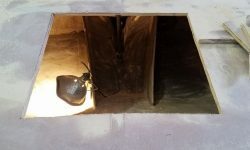 Later, I turned to the old hole leftover from a solar vent in the coachroof. 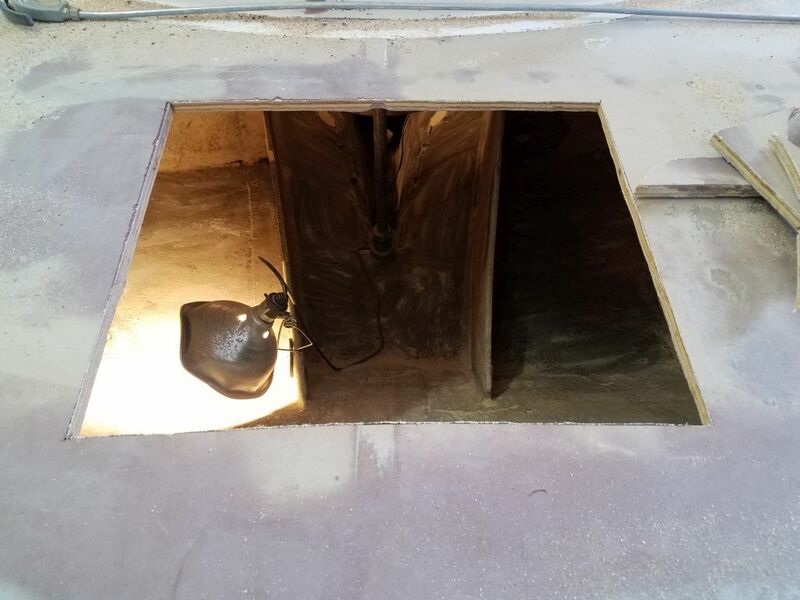 Whether or not a replacement vent was in the plans for the future, we decided to patch the existing hole and maintain flexibility for any and all new installations later, and earlier I’d prepared the opening for patchwork by grinding around the existing hole in the usual way. 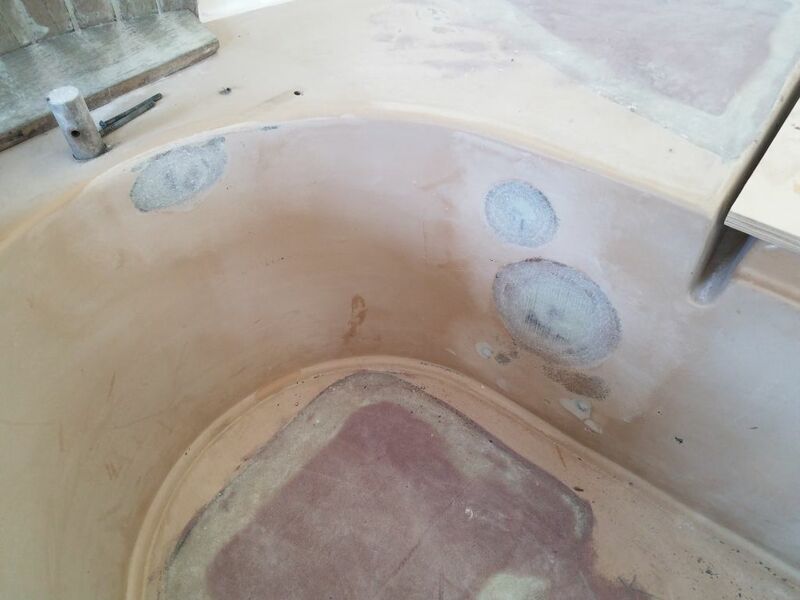 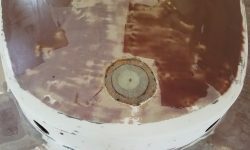 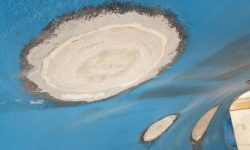 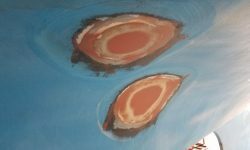 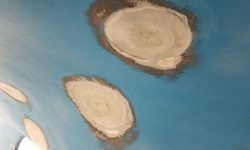 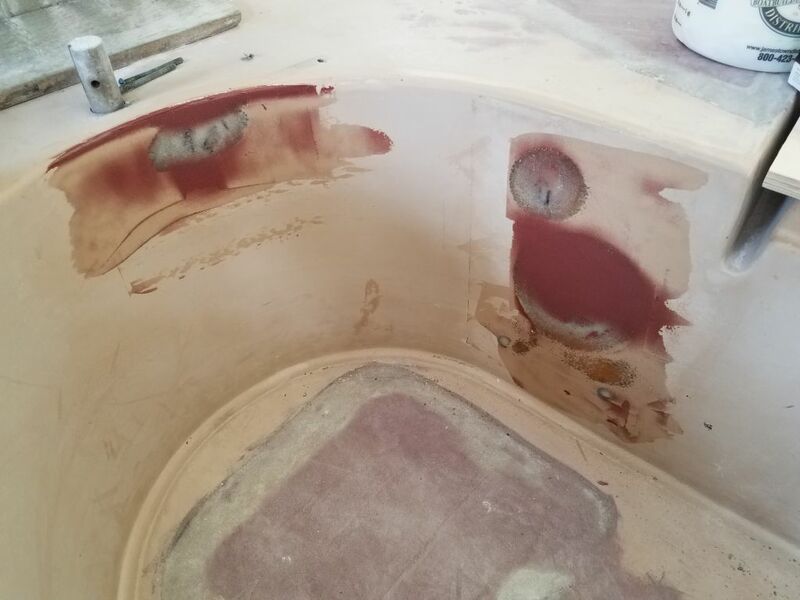 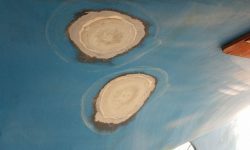 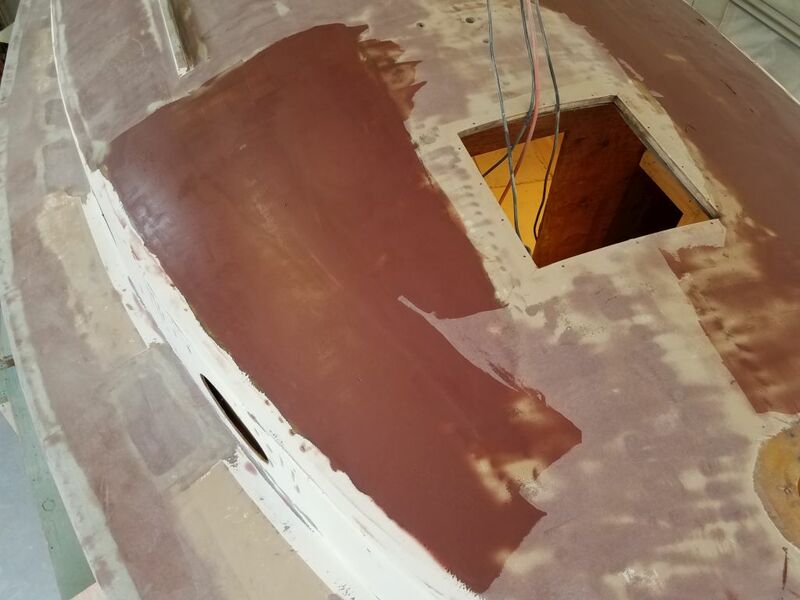 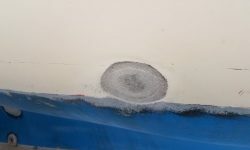 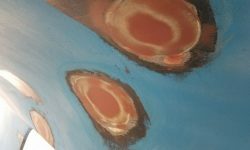 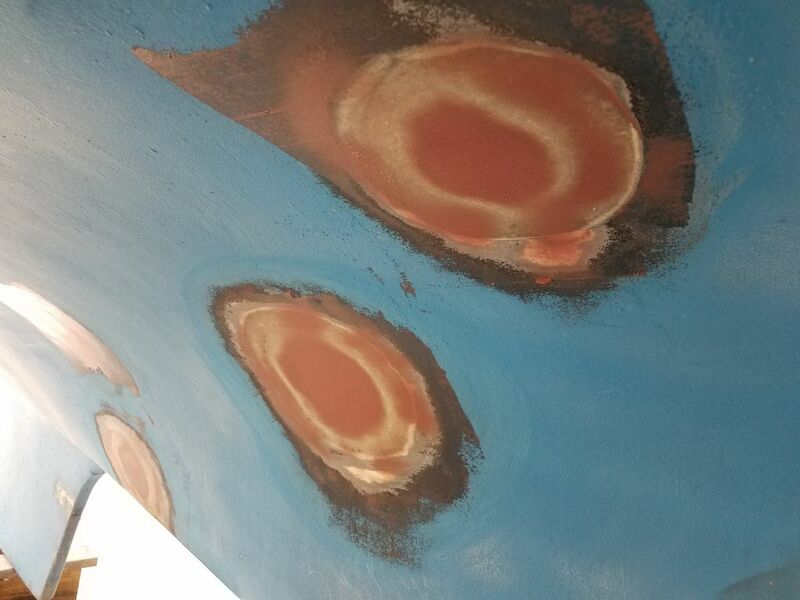 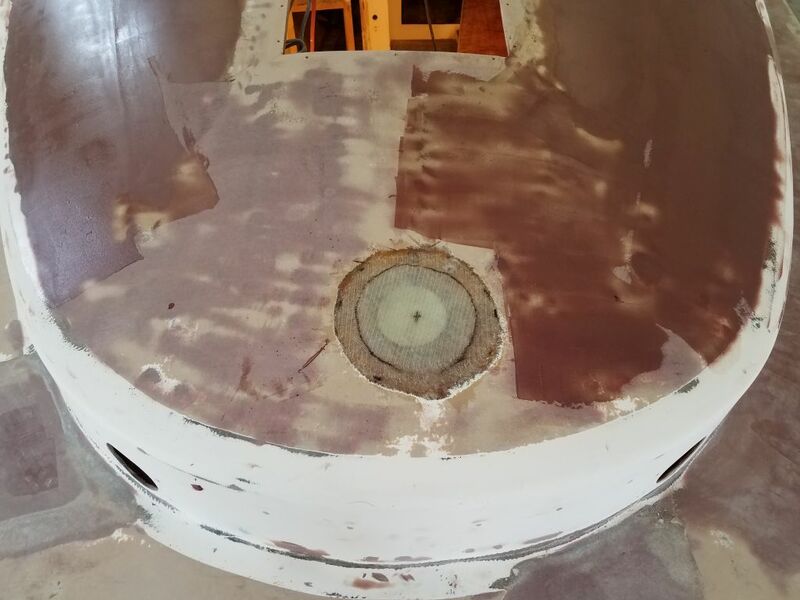 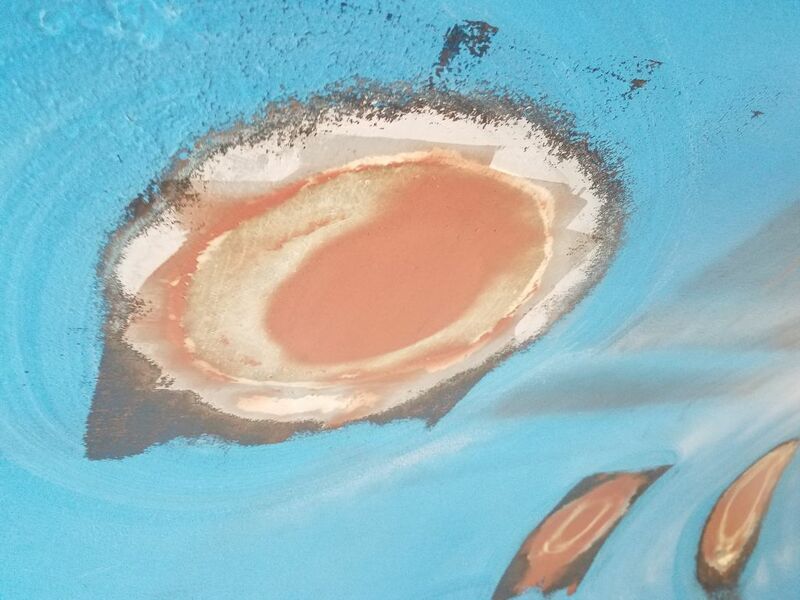 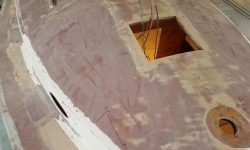 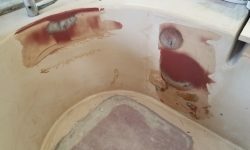 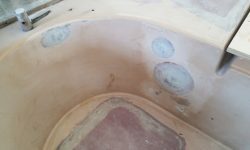 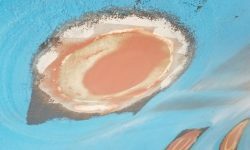 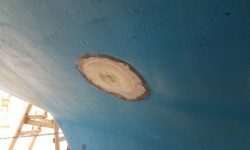 Now, I covered the inside of the hole and filled it with a structural epoxy plug before applying two layers of new fiberglass over the top, completing the patch. 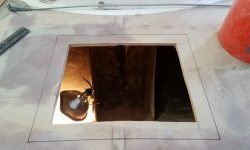 Sometime later I’d address the inside of the opening. 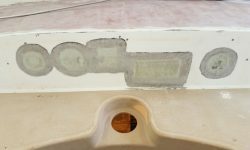 Finally, I decided to enlarge a bit the new cutout for the lazarette hatch. 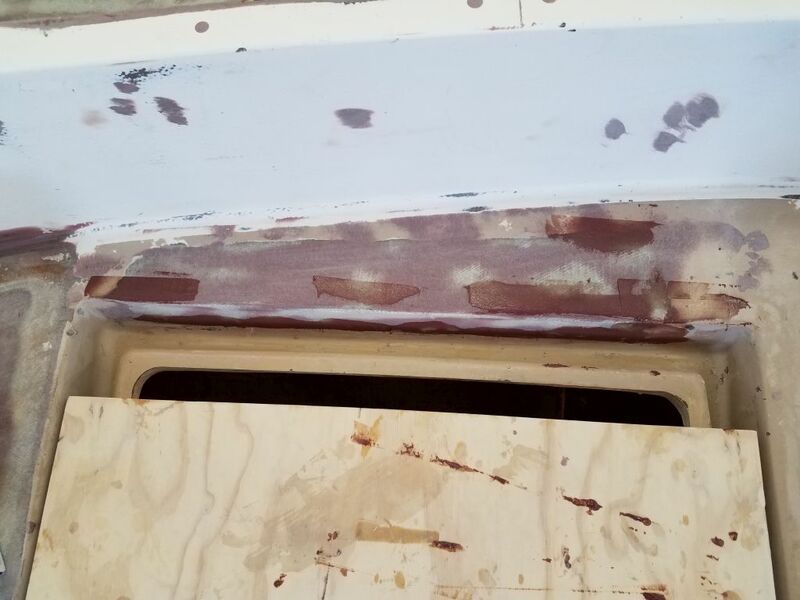 When I first cut the opening, I’d kept it a conservative size, not yet sure how large I could or should make it, but access would be enhanced with a larger opening, and with plenty of room inside it made sense to increase the size for better ingress to the space, as well as to make room for a hatch lining and raised edge. 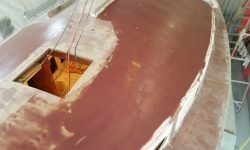 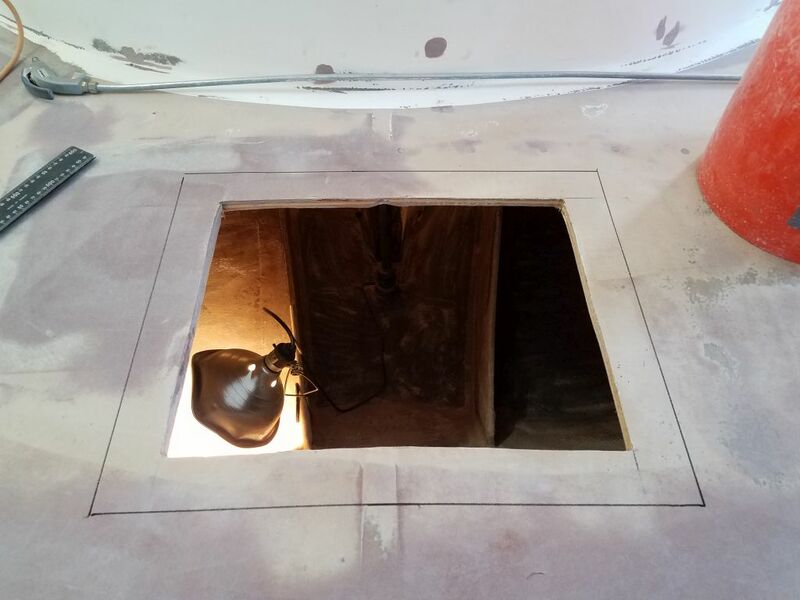 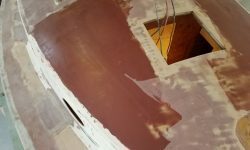 I enlarged the opening by 2″ on each side and made preparations for the next steps to continue work on the hatch opening.